inscription: Printed on the bottom edge: "(c) copyright 1996. 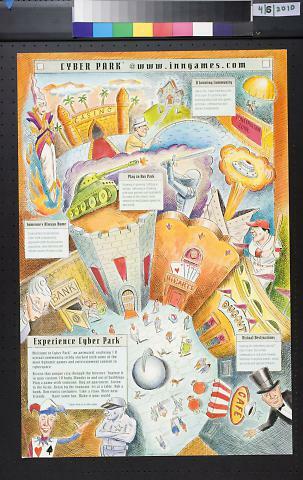 The Imagination Network, Inc."
Poster has a multicolor stylized image of a courtyard with entrances to various building fronts - a bank, castle, hearts card game, dugout baseball stadium, and a cafe. Above each building are images relating to the facades - a tank, a knight, a baseball player, etc. - along with images of a sorceress, desert oasis casino, house, man fishing, man parachuting, a UFO, a joker, a police officer and an elderly woman. At the top of the poster is "Cyber Park @ www.inngames.com". Scattered around the poster are details about the cuber world games in blue and gray boxes.